In my winter’s column, I mentioned younger surfers, due to the lack of proper preparations for their contests, often negate much of their unlimited mental drive. Egos being what they are, they begin to concentrate more on the fear of losing rather than regrouping and applying positive mental flow to their efforts. It’s true that the marshaling arena can sometimes be a troubling experience for younger gremmies. They often face power-bullet surfers decked out in colorful wetsuits, carrying the best of boards, ready to test any and all challengers. Strong-willed, they often try to press their mental psyche on known rivals. Beginning surfers may bear these attributes with time, although, gremmie or veteran surfers should not waiver in their methods, philosophies or techniques, for intelligent hard work does do things! Surfers tend to perform as prepared in body and mind. Gremmies might ask themselves, “do I have daily training goals? Do I have weekly training goals? Do I have monthly or yearly goals? Do I even have training goals?” If so, training should be designed daily or weekly, with a specific variety of useful surfing goals in mind. A weekly training session patterned with four days on, a break day five, with skills repeated days six and seven, employing greater and more difficult varieties each week. Prior to important contests, review newly practiced goals and personal objectives. Commend yourself over to patience and learn to endure. Understand that new radicals tend to come slowly. Remember back to when you were learning to walk or ride a bike...it was tumble and fall, tumble and fall, repeat, repeat, repeat. It takes demanding concentration and determination to win pressure heats in top contests. Having practiced new movements daily, develop a clear mental picture of your body’s intended action for each move. This is of the utmost importance before any correct decisive movement can take place. Concentration centered on wave choice and body actions, are most important. This and nothing more! Remember, even the most skilled surfers do not always win. Accept your limitations, but never become discouraged. Fatigue plays a big part. The body can recover its mental and physical drive with sound proper sleep. That is why a deep sleep is always important in helping surfers recover their competitive edge. Employ healthy sleeping habits. With proper workout schedules and rest, top surfers’ bodies will be tuned like a fine clock. Radical changes to these routines can be upsetting, both physically and mentally. Local Rusty Long, surfing the highest of high frigid waves off the Hebrides of Ireland and Scotland. Triton surfing team enters the USA-NSSA National Championships at Lower Trestles June 27th guided by their fine new coach John Dowel. It is here you will find a closeness of talented teams, like San Clemente and Huntington Beach. One can sense the heightened suspense they surely must feel, packed in those nose-bleeding tanky tents, surfers, parents, and coaches alike all cheering for their favorite surfers. These yearly contests are the goose- bumping championships where the most talented of America’s young groms, gremmies, and college stars gather. They test their surfing sovereignty against each other and even destiny. Apologies here for failing to mention in my last press, these talented SC surfers as well. Gavin Beschen, Jim Hogan, Micah Pitts, Dustin Franks, Brandon Raggenovich, Nate Yoemans and Lexie Papilion. 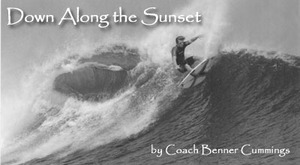 By the way, the San Clemente Journal’s own Outstanding surfier of the year for 2005 went to Tanner Gudaskas.